Want to win a Morgan Horse? AMHA’s “Team Morgan” is conducting an essay contest to promote the Morgan horse to equine-minded youth across the country and to raise funds for Team Morgan to travel to and host international equitation competitions. Copper Beech Morgans has graciously and generously offered the grand prize, a two year old Morgan gelding, CBMF Walk the Line, who is fondly known as Cash! The contest is open to any youth 21 years of age or younger interested in owning a Morgan Horse. Each contestant will submit a completed application packet, an essay, plus a signature form affirming the youth is able to care for the horse. Up to three finalists will be selected and notified to submit a DVD/video of themselves answering three interview questions. The cost of the application is $100. References will be contacted for each of the finalists. For three years, winners will be asked to submit a simple annual update to the Youth Council detailing the progress of his or her horse. Winners also are responsible for picking up and transporting Cash from Sebring Stables in Richmond, Massachusetts within two weeks of winning the contest.Applications are available from Sara Foy, sarafiremark@aol.com or call Sara at 603-642-4125 for more information. Submissions are due by November 15, 2008. Finalists will be notified by December 15, 2008 and interviews are tentatively planned to be completed by January 15th, 2009. Winners will be announced at the 2009 AMHA Convention. About Copper Beech Morgans: Ann Hailey’s interest in the Morgan Horse began more than 20 years ago. She spends hours on her breeding program with a focus on producing beautiful Morgans with athletic ability. 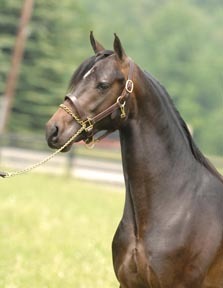 She uses several key stallions in her program including GLB Bell Pepper, a son of HVK Bell Flaire; DBA Street Talk, a son of Serenity Masterpiece; War And Peace, a Century Free Spirit son; and Ben’s Rhapsody, a Salem Command son. However, she considers the foundation of the program to be her great broodmares which include CEN Can’t Touch This, Medomak Lady of Fortune, Arboria Victor’s Pride, Ariel and Prelude to Passion. Numerous CBMF-prefixed horses have gone to the winner’s circle at the Morgan Grand National, including CBMF Ruling Class, CBMF Mozambique, CBMF Night Whispers, CBMF Arbitrage, CBMF Infatuation, CBMF Double Down, and CBMF Strike Zone, to name just a few. Additional information about Copper Beech is available at copperbeech.biz.